When changing a habit “they” say it takes 21 days. You might hear it takes 14 days or 60 days to change a habit. It actually can take years and many attempts to change a long standing habit like smoking. Also once you get really serious about changing a habit resistance sets in. Our brains are hardwired for a habit. Once when my power was off for three days, I still turned on the light switch every time I walked into a dark room. The last few years I have focused eating really healthy but I still have a chip habit. Granted now I buy all natural maybe only three ingredient vegetable chips, but I want to eat less. I get a little nervous when I run out. I tried making kale chips myself, I won’t give up but my first attempt was not pretty. Just like smokers have triggers for cigarettes, we can have triggers for foods. I found one of my triggers was a sandwich. As a kid I’m sure that was hard wired in my brain. I never want chips with a salad. Changing my diet to more vegetables and much less bread helped me cut back on chips. Take a look at your triggers for the habits you want to change. When I coach people they are often quite discouraged at the ups and downs in their progress. 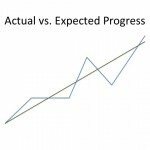 We expect change to be consistent and on a graph it would look like a straight line. Actually it is very natural to digress and backslide. The green line is what we expect the blue line is what usually happens. Tips for changing a habit. 1) Start small, for example go from one vegetable a day to two not right up to seven. 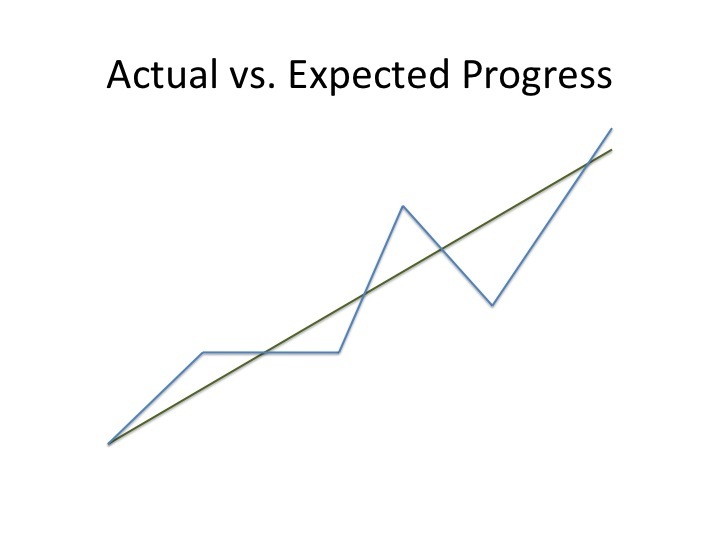 2) Chart your progress and just notice (not judge) your triggers and what prevents you from achieving your goal. 3) Find someone to report in to for accountability. I suggest a person who won’t nag you but who really wants to help and see you reach your goal. 4) Start with an easier habit to change when it will be the easiest to change that habit. Build on your success.